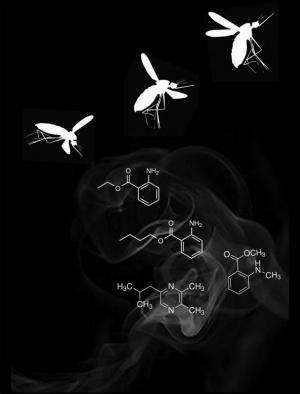 This image shows the chemical structure of the four compounds found to be strong mosquito-repellents. Credit: Ray Lab, UC Riverside. Insects are repelled by N,N-diethyl-m-toluamide, also known as DEET. But exactly which olfactory receptors insects use to sense DEET has eluded scientists for long. Now researchers at the University of California, Riverside have identified these DEET-detecting olfactory receptors that cause the repellency—a major breakthrough in the field of olfaction. Study results appear online Oct. 2 in Nature. "Until now, no one had a clue about which olfactory receptor insects used to avoid DEET," said Anandasankar Ray, an associate professor of entomology, who led the research team. "Without the receptors, it is impossible to apply modern technology to design new repellents to improve upon DEET." The method Ray's team used to identify the receptors examined in an unbiased fashion all the sensory neurons in the insect, which was the key to successfully finding them. In their experiments, the researchers used the genetic model system Drosophila melanogaster (fruit fly) that was genetically engineered in such a way that neurons activated by DEET glowed fluorescent green. The researchers thus found the receptors, called Ir40a receptors, lining the inside of a poorly studied region of the antenna called the sacculus. Introduced in the 1940s, DEET has remained unchanged for the past 65 years largely because the receptor in insects for DEET was unknown. Capable of dissolving plastics and nylon, DEET has been reported to inhibit an enzyme (acetylcholinesterase) in mammals that is important in the nervous system. DEET is also unaffordable and inconvenient for use in Africa and other parts of the world where hundreds of millions of people suffer from insect-transmitted diseases. Video of Ray discussing the research. "Our three compounds, which we tested rigorously in the lab, do not dissolve plastics," Ray said. "They are approved by the Food and Drug Administration for consumption as flavors or fragrances, and are already being used as flavoring agents in some foods. But now they can be applied to bed-nets, clothes, curtains—making them ward off insects." Using novel chemical informatics strategies, Ray's lab screened half a million compounds against the DEET receptor to identify substitutes. A computer algorithm the team developed identified which compounds are not only predicted to be strong repellents but also found naturally in fruits, plants or animals. The algorithm predicted nearly 200 natural DEET substitutes; of which the researchers tested ten compounds. Of these, eight were strong repellents on flies, of which four were tested in Aedes mosquitoes and found to be strong repellents. Of the four compounds, three are already approved by the Food and Drug Administration as food additives. "All three compounds activated the same antennal cells in flies as DEET," Ray said. "What's really encouraging is that some of these compounds may be affordable to produce in large quantities. In the future, using this algorithm, we could find chemicals that activate DEET receptors but are substantially different, with far better properties than DEET. We could find truly novel repellants that have remarkable properties such as large spatial protection and long-term protection." With the help of UC Riverside's Office of Technology Commercialization (OTC), Ray is exploring options for commercializing the technology. OTC has already filed two patents on the research. "We think there is incredible potential for a start-up company to develop new repellents based on Dr. Ray's current research," said Michael Pazzani, the vice chancellor for research and economic development at UCR. "In past work, his lab identified compounds that mask the host from insects, as well as compounds that serve as lures. The lab's new research has given us compounds that serve as repellents, making possible safe alternatives to DEET for a variety of applications including control of mosquitoes, flies, and possibly lice, bed bugs, ants, cockroaches, grain pests and agricultural pests." When commercialized, the findings by Ray's team could have wide applications. "Ir40a and its related proteins are conserved not only in flies and mosquitoes, but also in many other insects that are human and plant pests," Ray explained. "Our findings could lead to a new generation of cheap, affordable repellents that could protect humans, animals and, in the future, our crops as well." He was joined in the study by UCR's Pinky Kain (co-first author who found the receptor), former graduate student Sean Michael Boyle (co-first author who identified the substitutes), Sana Khalid Tharadra, Tom Guda, Christine Pham, and Anupama Dahanukar. The research was partially supported by the National Institutes of Health's National Institute of Allergy and Infectious Diseases (grants R56AI099778 and R01AI087785) and the National Institute of Neurological Disorders and Stroke (grant R21NS074332) and internal funding from UCR. In a separate study published Oct. 1 in the journal e-Life, Ray's group discusses a computational method, developed by Boyle, for screening thousands of chemicals and predicting which odorants—or odor molecules—will interact with specific odorant receptors. This research, too, may lead to the development of more effective insect repellents. Specifically, the researchers used their computational approach to study the interactions between 24 odorant receptors in Drosophila antennae and 109 odorants. They then identified common structural features in the odorants and used this information to screen more than 240,000 different odorant-like volatile compounds. For each receptor, they came up with 500 new odorants that were predicted to interact most strongly with it. They then tested their predictions for some receptors on living flies and found that approximately 71 percent of the predicted compounds activated or inhibited the receptors. Last I checked it isn't a repellent, it masks odors so they can't smell us. I'm guessing we still get bit because they don't totally rely on smell. If it was actually a repellent it would probably work 100% or not at all.